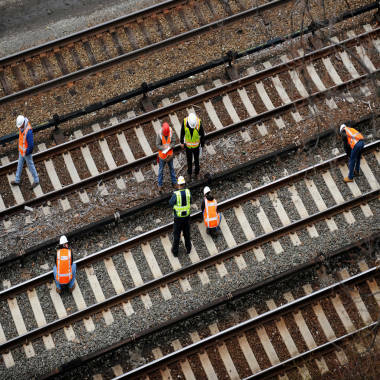 So far, the NTSB has found no signs of a mechanical problem in the train derailment that killed four people and injured dozens. NBC's Tom Costello reports. The engineer in the fatal Metro-North train derailment tearfully told the National Transportation Safety Board on Tuesday that he was in “a daze situation" when he took a curve at almost three times the speed limit, his lawyer said. His account came as federal investigators said they found no problems with the train's brakes and a federal agency ordered the Metropolitan Transportation Authority to take steps to improve safety after what it called a "simply unacceptable" series of accidents. William Rockefeller told NTSB investigators that he essentially zoned out -- "an autopilot kind of thing" -- before Sunday’s crash in the Bronx, his lawyer, Jeffrey Chartier, told NBC News. The 15-year veteran was then "jolted by a feeling that something was wrong" and eased up on the throttle and hit the brakes -- but it was too late, the attorney said. "Billy has been fully cooperative. He has not held anything back," Chartier said. "He is devastated. There are no words for how he is feeling. He was emotional today [at his NTSB interview], crying while he talked. He feels terribly for the families." The engineer, who suffered minor injuries, told police soon after the crash that he experienced "white line fever" — a term truckers use to describe being hypnotized by the road on a long trip, one source close to the probe said. National Transportation Safety Board and Metropolitan Transportation Authority inspectors check the train tracks leading up to the fatal passenger train derailment. Chartier said he would not say his client, who was standing in the cab, was sleeping at the critical moment the seven-car train approached a sharp curve with a 30-mph speed limit while roaring down the track at 82 mph. Although investigators have not ruled out the possibility Rockefeller was dozing, his lawyer said the engineer felt rested when he showed up for work at 5 a.m. Sunday, having slept from 8:30 p.m. to 3:30 a.m.
After years of working a shift that started in the afternoon, Rockefeller had switched to a new schedule with a 5 a.m. start just two weeks ago — and investigators will try to determine if a change in his body clock was a factor, transit sources said. There are no indications Rockefeller was texting or talking on the phone as the train jumped the tracks, sources said. Authorities are waiting for the results of drug and alcohol blood tests, but a breath test performed at the scene was negative. "Immediately after it happened he did everything he could to help people,” Chartier said. “He did not just walk away and get medical attention." 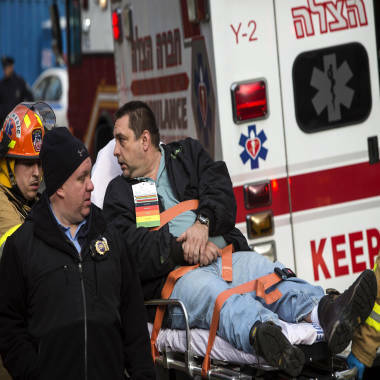 Metro-North engineer William Rockefeller Jr. is loaded into an ambulance after the train derailment. 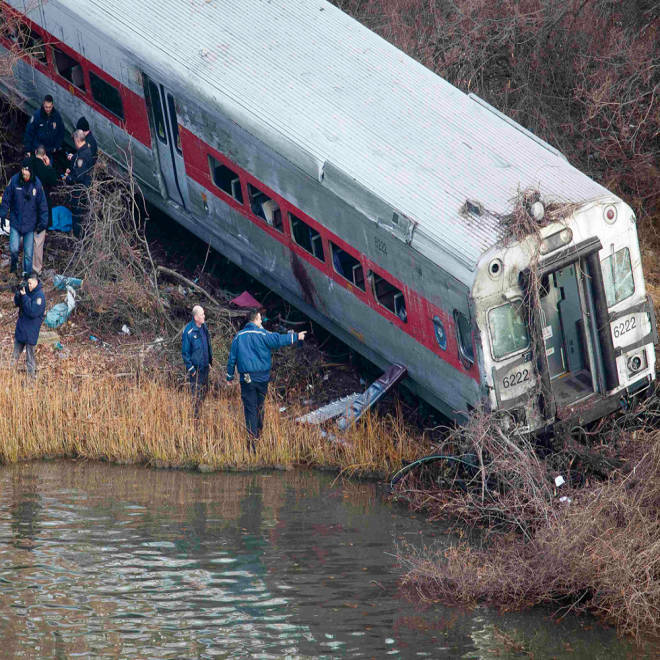 Four people were killed and 63 were injured in the derailment, the fourth Metro-North mishap in seven months. The head of the Federal Railroad Administration said Tuesday in a letter to the MTA that record was "simply unacceptable." Administrator Joseph Szabo said the incidents have "eroded the public’s confidence in the safety of the railroad transportation system." He ordered the MTA to institute "a confidential close call reporting system … to identify precursors to significant safety issues" and said the MTA should hold a "safety stand-down" with all employees. Black-box data recorders recovered from the wreckage showed the seven-car train was traveling at 82 mph — first in a 70-mph zone, and then as it entered the slow-speed curve before the Spuyten Duyvil station. Gov. Cuomo has branded the high speed "reckless." Chartier, though, said diesel engines can accelerate rapidly and that his client did not intentionally blow the speed limit. The data recorders revealed the throttle was engaged until six seconds before the train hurtled to a stop, cars tossed off the tracks like toys. The brakes were fully applied only five seconds before. “There is no indication the brake systems were not functioning properly," NTSB member Earl Weener said at a Tuesday briefing. He said the train was equipped with a dead man's pedal that the engineer keeps his left foot on. If he releases the pedal, the brakes are supposed to kick in. The pedal is being tested to make sure it was functional. During a news conference, An NTSB official discusses the various tests the Metro-North train braking system had gone through prior to, and on the day of the incident. It's possible that safety enhancements like a Positive Train Control system — which uses computers and satellites to override engineers and prevent accidents — would have prevented the derailment, he said. Cuomo said Tuesday that there are "all sorts of liability questions" arising from the derailment. “This operator is not going to be operating a train any time soon, I can assure you, but there is a process and he has rights,” he told WNYC. Rockefeller's attorney said he does not see "any criminal intent" in his client's actions, but police and prosecutors have not yet determined if he will face any charges. Legal experts said they will try to determine if he showed up for work well-rested and fit for duty, or if he was impaired by lack of sleep, a substance or an unreported medical condition. "Was he out late the night before? Had they recently changed his shift? Did he have a mini-stroke or something?" said Alan Abramson, who represented an assistant captain who was prosecuted in a fatal 2003 Staten Island ferry crash. If there was no recklessness, negligence or criminal intent, he might not be charged, Abramson said. "There are times when there are terrible accidents and people have been hurt or killed, but that doesn’t mean a criminal act was committed," he said. Civil liability is another matter, however, and the MTA is looking at the likelihood of multiple lawsuits. Several of the injured have already hired attorneys. Joel Faxon, who was already representing a dozen passengers from a derailment in Connecticut in May, said two from Sunday's mishap had consulted with him and have 90 days to file a claim. "There is no way that train should be going 82 mph," Faxon said. Rockefeller's lawyer and union representative said he plans to answer any more questions investigators might have. "He is not a guy who runs away," said Anthony Bottalico, head of the Association of Commuter Rail Employees Local 1. Metro-North retiree Michael McClendon, a longtime friend, said he can't image how Rockefeller feels. "I don't know how he's coping with the fact that he may have been responsible for the deaths of four people and 63 injuries," he said. "Knowing the kind of personality he is, that's going to weigh on him for the rest of his life. " NBC News' Jonathan Dienst, Tom Costello and Andrew Siff contributed to this report. At least four people were killed and 63 others were injured when a Metro-North train jumped the tracks as it was rounding a curve about 100 yards from a stop.